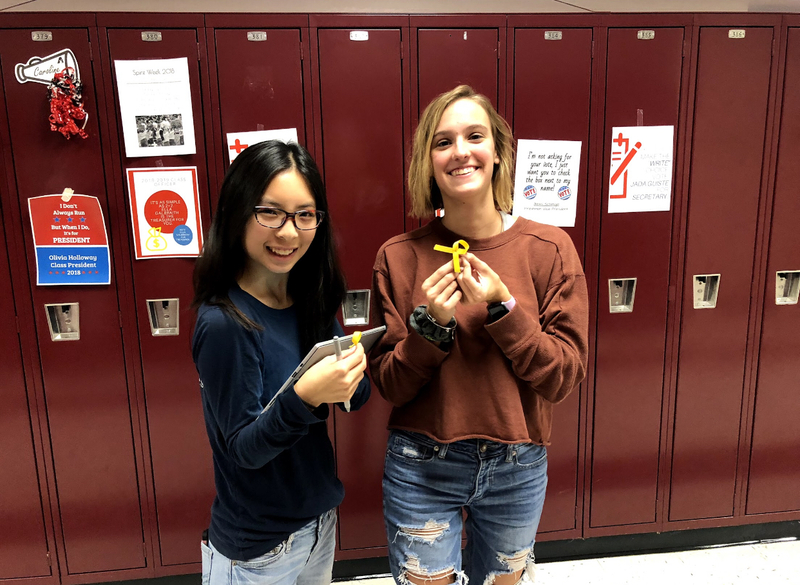 On Thursday, September 27th, students and staff alike donned their yellow t-shirts and gold ribbon pins to raise awareness for Childhood Cancer. The first Student Council fundraiser of the year started off successfully. By the end of the day, $244.87 was raised by teachers, administrators, and students by donating and buying ribbons to show their support. Teachers could donate two dollars and administrators donated ten and they could wear jeans to school along with a yellow t-shirt. 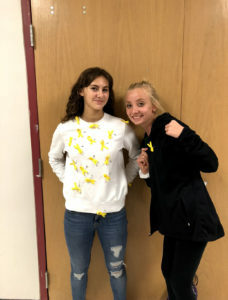 Junior Jessie Mellon and senior Bree Nowka are showing their support right after buying their ribbons from Hannah Palmer. Mrs. Sara Studt-Szalkuski, the High School Student Council sponsor, said the purpose of the fundraiser was to “recognize the hematology and oncology department at Children’s Hospital” who have “supported our area and our children who suffer from illnesses like cancer.” “It’s an awesome opportunity for us as a community to get together and wear yellow to show our support, but not only emotionally and physically, but in a monetary way,” she said. In just 3 short days, Student Council Officers planned the entire event. It started with students, like Hannah Palmer. “I’ve been asking teachers if they’d like to donate money for Children’s,” she said. For the past 4 days, Hannah has been going to teacher’s rooms and collecting their donations for Thursday. Students like Hannah and Zoey Miller also sold ribbons to their peers for 25¢. “Today we sold a lot of ribbons,” said Zoey Miller. 9th grade students Maggie Pappas and Ella Ciarimboli pose for a picture to show off the many ribbons they purchased to support Childhood Cancer Awareness. After Ms. Studt tweeted about the fundraiser on her twitter about the fundraiser, JAM Enterprises has generously decided to match the donations. JAM Enterprises has students from K – 6 that meet every Wednesday after school from 3:30 – 4:30 PM. “We make items, sell the items and then donate all profits to local charities,” said Ms. Maureen Frew, “We are actually running our own business – with 5 – 12-year-olds!” The girls in JAM created the famous #BeTheKind Campaign and to this date have sold over 6,000 Be The Kind Kid Shirts. Next, Student Council plans to sell bracelets for breast cancer. “We’re doing a breast cancer bracelet sale,” said Zoey Miller. Starting on Monday, October 1, Student Council plans to sell bracelets for one dollar each.